Android tablets can be bought at a whole range of prices, and cost doesn’t always indicate quality. Our youngest boy saved up enough to afford a cheap tablet last summer and we chose a Sumvision Cyclone 10″ device which, as a refurb unit from eBuyer, was superb value at around £85. With this to contrast against our own Nexus 7 devices, we realised that cheap-and-cheerful tablets could be great value. Although the rear camera which our lad wanted is, to my mind, a load of rubbish… he’s happy though! So for Christmas our eldest of course wanted a tablet, but his requirements were a little different: no need for a rear camera, and actually a 7″ unit might be better for portability. So the search was on… what 7″ tablet offers good value for money for kids? 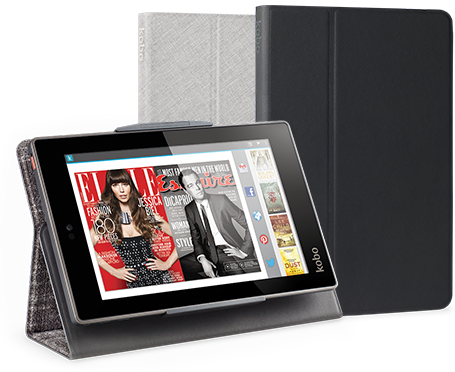 Enter the Kobo Arc 7. Designed as a posh ereader to compete with the Kindle Fire range, Kobo have clearly discounted the tablet in order to entice you to use their services. Out of the box, the device is skinned with their Tapestry UI which does a good job for those who use their tablet primarily for books, videos and images. There’s a bar which is permanently at the bottom of the homescreen giving suggestions for new content to buy – which for many people will be useful, although a quick google shows a lot of people wishing it would go away. At the end of the day, though, the launcher can be replaced in minutes with another from Google Play to either provide a native Google experience or else something else entirely. There’s no need to stick with Tapestry. Specs are not cutting-edge, as you might expect from a media device. There’s no need for top-end quad-core technology here so we get a perfectly adequate 1.5GHz dual-core instead – and I do mean it’s perfectly adequate, my lad has had no complaints because, yes this is the main criteria, it runs Minecraft PE with no problems at all. The screen is really nice: helped perhaps by being in a 7″ unit the 1280 x 800 resolution provides punchy images and colour/blacks are presented crisply. It’s really a very nice screen. One small grumble is that the bezel is raised slightly all around the screen, making off-screen to on-screen swipes – such as bringing down the Android settings bar – a little unwieldy. It’s not a bit issue, but one which seems unnecessary. Charging is via a standard micro USB, which is also the way to connect to a PC to get some media onto the thing. It’s an Androidn tablet so the full suite of Google Apps work, with full access to the Play store, so you can opt to use cloud services such as Google Drive to load content, of course. But I don’t find that a very good way to get large media onto a tablet. Sadly there’s no SD card slot, so buying anything less than the 64Gb model may be a bad idea – depending upon how you use your tablet, of course. The wifi on my other lad’s Sumvision is terrible, requiring him to be within a few feet of the access point, but the Kobo has reception all around the house – just as the Nexus 7 does. This is a very good reason to go with a brand, wifi radios in cheaper units often get bad press on the internet. Pre-loaded apps Facebook, Twitter, and Skype. Stream music from Rdio, access your magazines and newspapers through Zinio and PressReader. Google apps: Google Play, Gmail, YouTube, Google Maps, Street View, Calendar, Contacts, Google+, and Google Chat.